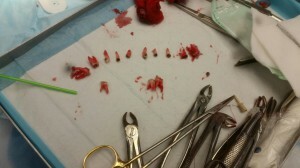 13 teeth extracted from one 7-year-old boy. Photo taken with his mother's permission. While I was traveling on the Mobile Surgical Bus a lot of the lists performed in the North Island were paediatric dental lists. These are children that have failed to have dental work done successfully in a normal dental clinic due to the difficulty of the procedure or inability of it to be performed on an awake child. These kids would, therefore, have their dental work done under general anaesthetic. Lists normally had about seven to ten children per day depending on the amount of time needed for each procedure. These children could be anywhere from two to 15 years old, most were normally in the four years to eight years’ age group. Initially, the patients would be pre-assessed and have the relevant paperwork filled out. The kids would then come into the operating room with their parent or guardian and would be put under by “gassing them down” using sevoflurane at increasing doses. Once they were unconscious I would put in an IV cannula and set up fluids while the anaesthetist maintained their airway. The anaesthetist or I would then administer the necessary anaesthetic drugs and following this we would put in either a nasopharyngeal tube or an LMA depending on the preference of the dentist. Once all this was done the dentist would do his work. I was amazed by the level of dental decay some of the children we saw had. It was not uncommon to have children needing more than 10 teeth extracted due to severe decay. The most teeth I witnessed being extracted from one child was a young boy of seven years old in Snell’s beach, about an hour north of Auckland. On examination of his mouth, it looked like a bomb had gone off in there. All his incisors were black and broken down to the gum line and his molars were almost non-existent. In the end, we had to extract 13 teeth from the little guy. I had a chat to his mother while he was in recovery and she said that his diet consisted of mainly fizzy drink and sweets, as that’s all she could get him to eat, also he hadn’t brushed his teeth in over 4 years. The mother knew that this was a recipe for disaster but didn’t seem too worried. “Trying to fight with him to brush his teeth just wasn’t worth the effort.” It’s safe to say that if they continue the same trajectory his adult teeth don’t stand much chance either. How we can help people in this situation I’m not quite sure, most families I talked to were of low socioeconomic status, many were anti-fluoridation of public water and felt it was their young children’s decision whether they wanted to brush their teeth or not.